Alton Byers has worked in the Andes, Himalayas, Appalachians, East African Highlands, and many other ranges for over 30 years. By reproducing old photos of glaciers taken by early glaciologists, cartographers, and climbers, Alton demonstrates in a very visual way how much glaciers have declined in the last 60 years. My name is Alton Byers and I am 56 years old. I’m a mountain geographer and have been a mountain climber since I was 17. In recent years I have taken a number of photos of glaciers in Nepal and Peru from the exact same spot as photographers from over 50 years ago. The obvious decline of glaciers in these areas is startling. I first started climbing in Tanzania and climbed Mount Kilimanjaro in 1969 at age 17. Then the following year I returned to the US and got a job with the US Parks Service at Yellowstone National Park. Every weekend I would hitchhike down to the Grand Tetons to climb and I continued to climb in North America throughout the 70s. In 1984 I spent a year living in the Mt. Everest region doing the field work for my doctorate in Geography, focusing on soil erosion and contemporary landscape change. Following two years in the Virunga Volcano region of Rwanda as director of a conservation project I joined The Mountain Institute, and founded the Andean Program in the Huascarán National Park in 1995. I still climb whenever I can, mostly the smaller snow peaks such as Urus, Ishinca, Pisco, Vaillaraju, Kilimanjaro, etc. that I really enjoy, and spend a large amount of time in remote and roadless mountain regions in the course of my research and work. This gives me a great opportunity to observe, think about, and talk to local people about the impacts of climate change during the past several decades. In 1988 I first started documenting climate change in Peru, where there is probably no better case for climate change than the Cordillera Blanca. In the 1930s, Erwin Schneider, a top climber and member of the Austrian German Climbing and Cartographic Expeditions to the Cordillera Blanca and Cordillera Huayhuash, took many photos of glaciers and high altitude landscapes in the course of producing the beautiful Alpenvereinskarte maps. I was able to locate a large collection of his photos at the Austrian Alpine Club in Innsbruck and started to reproduce them by relocating, as near as possible, Schneider’s original photopoints — a process known as “repeat photography” — to find out what the changes in the landscape were. Since I started taking my own photos, I have noticed a tremendous change in glacier ice. Ice melting in the Cordillera Blanca has been well documented over the last 60 years, but I can now look at photos I took only 10 years ago and see even further changes in the glaciers, the retreat of glaciers, and the formation of new and sometimes dangerous glacial lakes. As well as the photos of Peruvian glaciers, Schneider also took many photos of the mountain valleys to the south and west of Mt Everest in the 1950s that I have also replicated in the course of a number of landscape change field expeditions during the past 20 years. Then in 2002 I inherited hundreds of old photos of the Everest area that were taken in 1956 by Fritz Müller, a Swiss-Canadian glaciologist, following his participation as scientific team leader of the 1956 Swiss Mt. Everest Expedition. The box also contained panoramas and photographs taken by Schneider, and the contact prints of Dr C. E. Evans from the 1953 British Expedition. From October to November in 2007, and again in April-May 2008, I retraced the footsteps of these early glaciologists, cartographers, and climbers; relocated their photopoints high above the valleys and seasonal villages below; and re-took their photographs. When I replicated the panoramas and photos from the scientists and climbers in the 1950s the results were startling in terms of the before and after changes in glaciers. Many of the small, “clean” glaciers at the lower altitudes had vanished. The larger glaciers at the higher altitudes had receded significantly. New lakes had formed where only 40 years ago there had been a debris covered glacier, and even the larger glaciers somewhat insulated by a thick cover of debris had clearly lost considerable volume. It’s important for people to understand that climate change is happening, and that our mountains are going to need special conservation attention to protect mountain and downstream populations against the predicted increase in floods, landslides, and glacial lake outburst floods; to buffer us against warming trends by restoring forests and alpine ecosystems; and to protect the water supplies and other ecosystem services that billions of people living downstream depend upon. People in Peru are very worried about water in the area. We don’t know exactly how much water comes from the glaciers, but it’s probably about 40%. A number of people are quite concerned about what’s going to happen when the glaciers are gone, which they predict could be as soon as 50 years from now. When glaciers melt you’re also increasing the likelihood of glacial lake outburst floods. The Cordillera Blanca area in Peru has a history of tragic catastrophic events, several related to glacial lake outbursts. One catastrophic outburst flood took place in 1941 right above Huaraz and it killed 5000 people. That immediately prompted the government to form a glaciological unit that has since lowered or “controlled” some 35 potentially dangerous lakes. Given that there hasn’t been a catastrophic outburst since 1941, they seem to have been very effective, although a chronic lack of funds and rapid rate of new lake formation has a lot of people concerned about the future. People in the Everest area are also worried about outburst floods. In 1985, in the Everest area, the Dig Tsho glacial lake burst and destroyed a hydro-electric facility that was almost near completion, wiped out homes and killed a number of people. Outburst floods can be very dangerous and they’re getting a lot of attention now in Nepal. We’re hoping to host a workshop in Peru next year that will include Nepali and other glacial experts in the Himalaya-Hindu Kush region, to give them the opportunity to exchange experiences and learn from the Peruvians with their 60 years of experience in controlling dangerous lakes. From my conversations with local people, they are also saying that they have witnessed an increase in variability in climate. The climate is just not as predictable anymore. People can no longer say: “Well it’s going to rain this month so we can plan on planting our crops.” Because of this change in weather patterns, farmers in the area are very concerned about their livelihoods. People also talk about extremes in weather. For example, when it does rain, it’s torrential, or when it does snow, it’s a huge devastating snowstorm and because the snow is so heavy rooves cave in. We’ve got some good remote sensing studies, climate modelling, and new data gathering initiatives that ICIMOD (International Centre for Integrated Mountain Development) and other organizations such as the World Bank have done, and of course climate change is receiving a huge amount of press and attention. However, very few people seem to be actually on the ground talking to local people to find out what their perceived impacts are. For example, how is climate really affecting their lives? In terms of water supply, agriculture, livelihood, safety — what are the threats that have been identified? What are the opportunities? And what are some solutions? The Climate Witness programme is a wonderful step in the right direction, since only by understanding what’s happening on the ground will we be in a position to help people adapt and build their resilience to climate change — sometimes by listening to their recommendations, sometimes by bringing the science to the community. This includes social, economic, environmental, and hazards resilience, and a lot of it boils down to just building people’s capacities to solve problems. I’m especially interested in helping people build environmental resilience to climate change through the conservation and restoration of their alpine and other high altitude watersheds. Continuous vegetation (as opposed to bare and eroded hillslopes) acts as a buffer against warming trends, is the best protection for water supplies, maintains biodiversity, and encourages visitors to come year after year. But above all, we need to start promoting a more interdisciplinary approach to our understanding of climate change, one that blends the best of the laboratory with that of the field practitioner and local community. Alton Byers works for The Mountain Institute, a non-profit organisation dedicated to the conservation of mountain ecosystems and improving the lives of the people who live there. 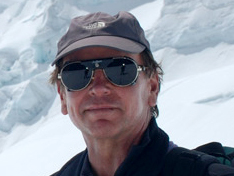 He is also a member of the American Alpine Club (AAC), a partner organisation of the WWF Climate Witness Programme. The Mountain Institute and the AAC have formed the Alpine Conservation Partnership to protect and restore alpine ecosystems worldwide, and to promote community based research to help people adapt to climate change impacts. A scientific review by a member of the Climate Witness Science Advisory Panel is pending. 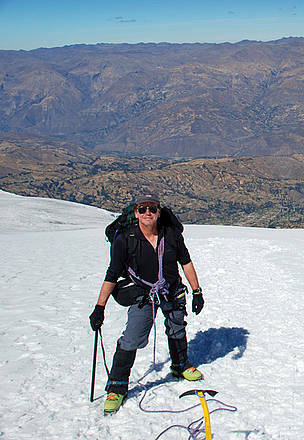 Alton Byers on Huascarán in the Cordillera Blanca range in Peru. 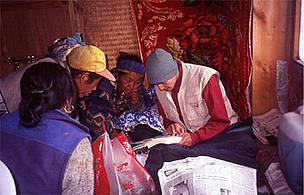 Working with local people in the Everest region to identify risks and opportunities relating to climate change impacts.